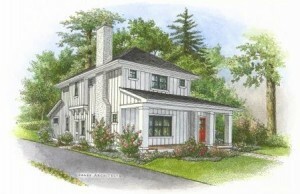 We’re excited to be in the 2010 Grand Rapids Parade of Homes! This year’s home is at 2234 Lake Dr. in East Grand Rapids. Designed by Sears Architects and built by Insignia Homes, this “Urban Farmhouse” features the unmistakable interiors of Rock Kauffman. The home is located across from East Grand Rapids High School, on the south side of Lake Drive. East Grand Rapids continues to be a very desirable place to call home given its superior school system, unique neighborhoods, proximity to Reeds Lake and downtown Grand Rapids, and the active lifestyle it promotes. While there are some large residential sites in East Grand Rapids, many of the homes near Gaslight Village have relatively small lots, fostering a closer sense of community. The landscaping at this home is an excellent example of how the right planning and design can create a beautiful outdoor environment on a smaller site. Not only does the home’s landscaping add curb appeal, but it also creates for the homeowner a peaceful setting in a vibrant and active community. This home’s landscaping is also a good example that great landscape design and construction doesn’t have to cost a million dollars. If you’re touring the Parade of Homes this year, be sure to stop by this home and leave us a comment on the blog about your thoughts on the home’s landscaping.